Day Sixteen of the 30 Paintings in 30 Days Challenge. This painting is "Butterfly, Bee, and Baritone". I masked the bee and butterfly and some of the shiny spots on the baritone. A baritone is like a small tuba. I decided to zoom into the baritone instead of showing a larger view so that you could see the bee and butterfly better. I started by painting the baritone on the right side and then laying down the other various grays. I make my own gray mixes. One of my favorites mixes is cobalt blue, permanent rose, and aureolin yellow. The bee and butterfly are a nice compliment to the shiny metal. 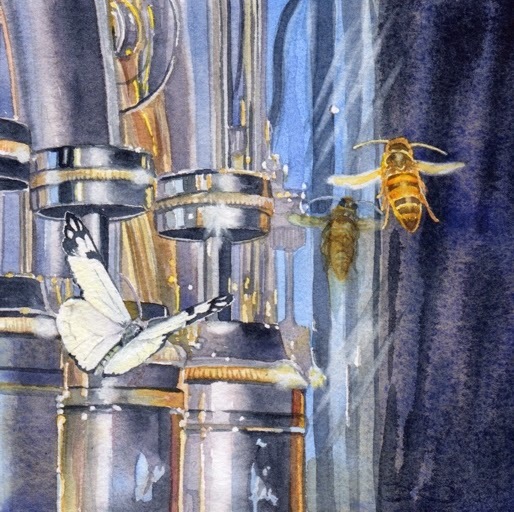 This painting, "Butterfly, Bee, and Baritone" is a 6"x6" watercolor and is available on Daily Paintworks for $150 (framed). Click here to purchase. Lovely job Lorriane - you have your shiny spots down!! Très jolie aquarelle... Une harmonie de couleurs magnifiques. J'aime le travail du papillon et de l'abeille qui se reflètent sur le corps du baryton.